I seem to find many applications where a simple, cheap and reasonable power amp is required for portable circumstances. The TDA7052 is a really simple to build power amplifier with a powerful output. The chip is built by Philips Semiconductors and a data sheet is available here. The circuit shown in this data sheet is very simple indeed, requiring only two other components (three if you include a simple logarithmic volume control). Below is a layout for the amp for beginners using veroboard or 'stripboard'. The layout is simple, but you will need to use a few wires and a track breaker of some sort where the amplifier chip is soldered onto the board. The layout does not include a volume control or an LED. If you have some understanding of electronic circuit design, then you can easily incorporate these onto the board. This may (will) require additional wiring and/or track cutting for the preferred layout. My stripboard version I made for testing is shown below and it can be seen that the layout is very similar to above. You will notice that I have used a socket for the chip and that the chip is not inserted, this is because it is in use elsewhere. The dotted line shows where the tracks MUST be cut. If this is not done sufficiently, the amp will not work. You can do this with a proper track-cutting tool available at some retailers (this is recommended) but if you cannot get one, it is possible to cut the tracks with a knife. You need to select a good knife that is small and sharp. You also must be very careful, it is easy to slip and damage something or yourself - this is why I do not recommend this technique. Use a multimeter (or if you do not have one, a battery and bulb/buzzer circuit) to make sure there is no short between the cut tracks to ensure that they are cut fully and properly. If you break the track below the amplifier chip (next down from pins 4 and 5) then you can use solder to jump the gap you made, or jump it with a wire. This track must remain uncut or pin 6 will not get the ground connection its needs. Soldering is required to fix the components to the board. If you're a beginner and have not done this before, by all means practice. Soldering on stripboard can be difficult and it is easy to short the tracks if too much is used. Once this is done, it is very, very difficult to sort without the right gear (i.e. desoldering equipment), you will soon get impatient and angry so its best not to use too much solder in the first place. The 0.1uF (or 100nF) is a polyester capacitor with lead out spacing of 1cm (10mm) such as the ones I get. The 220uF capacitor is an electrolytic capacitor rated at 16V. Positive is shown on the diagram, negative is the other terminal and this is clearly indicated on the capacitor case. THE CAPACITOR MUST BE CONNECTED THE RIGHT WAY ROUND, otherwise you'll get a fireworks display with higher voltages (i.e. 9-12V). Injury may occur. Do not use above 18V on this amp or it will get too hot and shut down. These devices can run quite hot naturally and my chip wasn't happy running at high voltages with demanding music (could be the load). If you can get an axial lead electrolytic capacitor, you can avoid an extra wire (and complete track) by mirroring the connections made by the polyester capacitor. The positive must go next to pin 1 on the TDA7052. 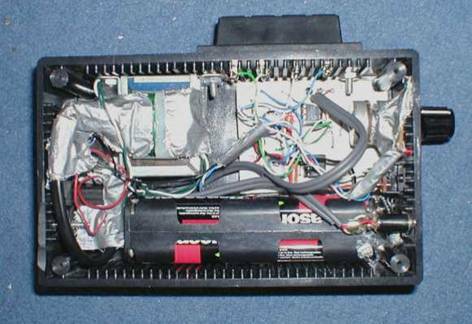 When wiring the loudspeaker, do not ground it. The TDA7052 uses BTL (Bridge Tied Load) which gives you up to 4 times the power with two amps (which are integrated in the TDA7052). If you short the loudspeaker to ground, do not expect it to work. As a last note, make sure you put the TDA7052 in the right way before you solder it. The diagram shows a semicircle on the chip. This semicircle should be on the chip itself two and it must also be at the top. If the semicircle cannot be seen, look for an indent or printed circle to the left of where it should be. This indicates pin 1 and this means that the chip should be placed with the circle at the top left. Insert the chip the wrong way and it will not forgive you and you will have to get a new one, trust me, I've (foolishly) done it! THIS SYSTEM HAS MAINS VOLTAGES. THEY ARE VERY DANGEROUS. DO NOT WIRE IT UNLESS YOU ARE SUITABLE QUALIFIED, DEATH OR SERIOUS INJURY MAY RESULT. When I was in the school sixth form, I used to find requirements where small portable speakers would be useful to have. I decided that I would build a system based around this amplifier since I had used it before and was more than happy with its performance. My version is stereo, this means that there is two TDA7052 chips, four other components and a dual gang log volume control. I bought a plastic box and designed my own PCB for use with it. Since I bought quite a large one, I decided that I would use a battery box that contains 8 times 1.5V AA cells (or UM-3, M, RX6 or whatever they are called where you live). There was also room for a spare transformer I had - if you're a beginner though, DO NOT attempt to wire transformers because there is mains electricity involved. If you want your little amplifier to be powered by mains, buy these universal DC adapters that allow you to select voltage outputs and the polarity. I have one that has a max current output of 300mA (or 3.6VA) and its unregulated that happily powered the two amps for years now, it currently is my main computer speaker amplifier. I would suggest higher power if you can get it though. The circuit diagram for my set-up is below, it shows all the components required to build the system, including that of the transformer, remember if you're a beginner or not suitably qualified, replace the outputs of the regulator with a DC plug. You may question several things here, firstly the mains input. Well the plug that I managed to obtain is a figure 8 mains plug that you regularly see on the back of cassette decks, Ghetto-Blaster's and some hi-fi equipment. The one I have has a dual position switch that selects the power source for me. By default, it is touching two contacts, which are the output contact and the battery connector. When a plug is pushed in though, the switch disconnects the batteries and connects the output of the rectifier that I built. The transformer that I used powered an old stereo system that I could not get working again, so I recycled parts from it! I have no idea what its rating is (its pretty small though) but I measured the output to be 6V (AC of course). Two diodes and a capacitor makes the rectifier so I can obtain about 8 to 9V DC to power the amps. 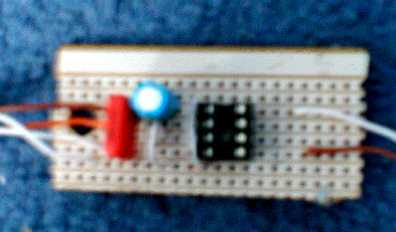 The output then enters a slide power switch, followed by an LED for 'on' indication. Remember, if you use an LED, it must go the right way round (it's a diode) and it must have a resistor in series with it or it will blow up. I used a 680 ohm resistor, anything similar (i.e. 1k ohm) will also work. For the cost and simplicity, the TDA7052 is a brilliant solution to the portable, battery operated amp problem. The speakers I use a 2.7 ohm (yes 2.7) with a 4 ohm tweeter in parallel for improved high frequency response. Most amps (especially when bridged) would absolutely hate this kind of load, but the TDA7052 has worked for ages into this load and does not get too hot either. Some would comment about the design of my speakers here, well the reason why they are as they are is because they sound great without a bulky box. Therefore I only built a baffle board with a stand for simplicity and flat packing! 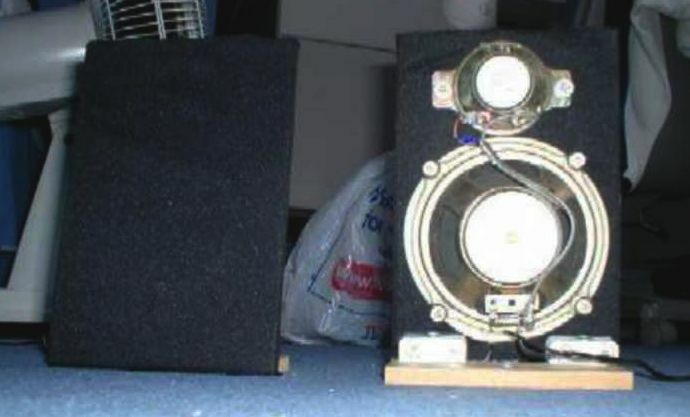 These speakers have now been dismantled, the wood was binned and the speaker drivers are now used as rear computer speakers in my TDA2822 system. Battery performance is good too. Remember that my system is stereo but it still runs for weeks on a good set of batteries and it will still run when the batteries become quite flat (with less top volume). I am pleased with my set up because it gives me good sound (it does have low frequency response too) and has plenty of volume for most circumstances (except for those who demand music at high, often distorted, volumes). For me, it gave my laptop the sound boost needed when playing DVD's which are too quiet for its internal amp and speakers (they sound rubbish as you can imagine).